Bryan Smith grew up in Flat Track racing, first racing in the sport at the age of seven. 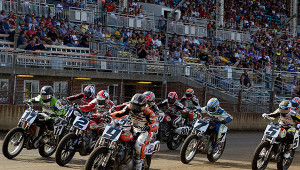 Since 2001, Smith has been competing at the AMA Pro Flat Track Grand National Championship level, earning an impressive collection of top-10 finishes, podiums, and wins throughout his Flat Track career. He won the GNC Expert Twins Championship two years in a row (2012, 2013), and he won the Sacramento Mile a record seven times in a row from 2011 to 2017. 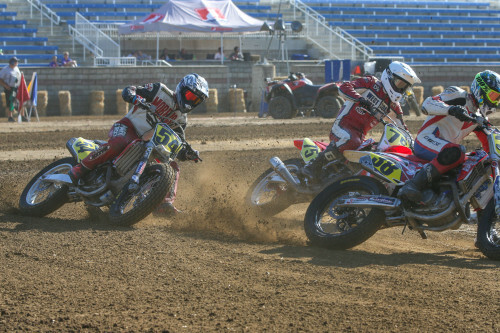 Smith had an impressive showing at the 2015 X Games, winning gold in the Flat-Track event. 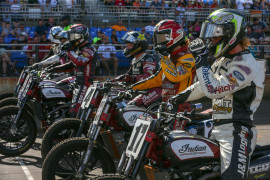 Invited to compete in the Superprestigio of the Americas in 2015, he took 4th place in the Flat Track Final and 8th place in the Superprestigio Final. 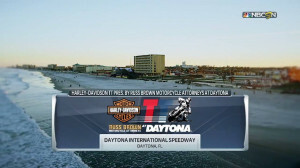 After riding the Factory Indian Motorcycle FTR750 for Indian Motorcycle in 2017 and 2018, Smith is now reunited with the Crosley/Howerton team and will pilot the No. 4 Kawasaki Ninja 650 in 2019. Early Career Began racing BMX at age six, then moved to Flat Track and Ice Racing at age seven. After coming short of the title in 2017, Bryan Smith is motivated more than ever to take that number-one plate back aboard the Indian Scout FTR750. He also looks to continue his climb in the record books. With four wins in 2017, “Mile Master” currently sits ninth on the all-time win list and fifth in Mile wins. 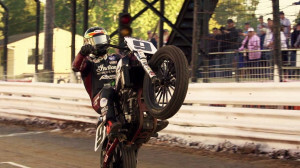 Smith rode for the factory squad - Indian Motorcycle Racing backed by Allstate. 2017 Bryan Smith started strong in 2017, with seven podiums in the first eight races and four wins. He struggled a bit in the latter part of the season but was still consistent enough to finish second in the AFT Twins championship to eventual winner Jared Mees. 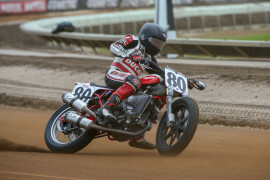 Overall, Smith posted 9 podiums and 15 top-ten finishes on the Indian Scout FTR750. 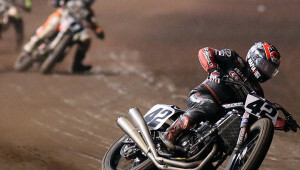 Smith took home his first Grand National Championship with eight podiums including four wins (Arizona Mile, Sacramento Mile, Springfield Mile, Black Hills Half-Mile). 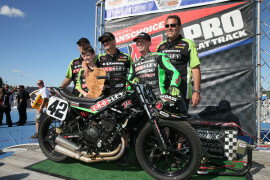 Raced for Crosley/Howerton Motorsports Kawasaki. Top contender and fan adored, Smith earned second in the GNC1 class behind rival Jared Mees, despite an impressive five victories. 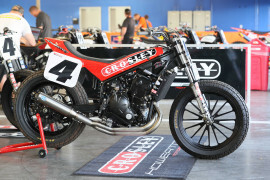 Raced for Crosley Brands/Howerton Motorsports/Kawasaki. 2014 Smith looked to have the GNC1 championship in his grasp until a smoking bike led to a black flag at Calistoga. Smith didn’t bring the bike into the pits and was later disqualified, forfeiting the points from a second place showing and putting himself just too far behind eventual champion Jared Mees. Smith’s remarkable season inclused a series-best five victories, including Kawasaki’s first ever Half-Mile win. Outside of the disqualification, Smith was in the top 10 in every race except for the opener at Daytona. 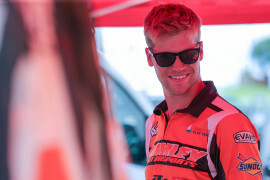 2013 Smith excelled on mile-long courses, winning two races on his way to earning the coveted GNC Expert Twins Championship. Two wins and 12 top 10 finishes helped Smith win the GNC Expert Twins Championship. Finished fourth in the overall standings and locked in 11 Top 5s. His two wins came at the Cal Expo and the Illinois State Fairgrounds. Both victories came on mile-long tracks. 2011 Smith won the California Expo Fair GNC Twins event. He also earned two Top10s and six Top5s. 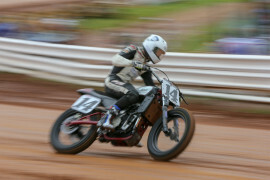 Raced with Fasthog.com Harley-Davidson/Honda. 2010 Smith had an impressive season winning the Indianapolis Mile in front of the MotoGP crowd onboard his Ninja 650 Kawasaki, and following it up with a win at the Springfield Mile Sept. 5th. Raced with Monster Energy/Kawasaki/Werner-Springsteen Racing team. 2009 Smith won the AMA Pro Grand National Twins race at Lima, podiumed twice at Indianapolis and Grove City, and had a total of six Top5 finishes. Raced with Moroneys Screamin Eagle Harley-Davidson race team. Finished 2nd in twins points, with one win at the Beulah Mile in Ohio. Also earned one podium in the singles at the Daytona Short Track. 2007 Finsihed third in the twins points, had one win in the single division at the Castle Rock ST.
Won two GNC events - the opening round at the Daytona Short Track and the fall Springfield Mile, finishing the year third in the twins points. 2005 Joined the Moroney's H-D team and earned a few podiums.